It has been a while since I’ve written something here, so please bare with me—my words might come out a little bit ruffled and/or rusty. Having said this, hopefully it won’t be true of the new set of drawings I’ve been working on. These were not commissioned, but actually started life last summer in my sketchbook as small experiments with visual puns and playful graphic shapes. The ideas that came out also reflected my current preoccupation with direct, bold visual storytelling through accessible metaphors—all peppered with tongue-in-cheek humor. Humor is an element in my work that I’ve mostly tried to downplay or even suppress for several years, likely for fear of coming across as “not serious enough” as an artist or visual communicator. Of course this was probably never an issue for many of my heroes, Tomi Ungerer, Saul Steinberg, and Quino among them—all artists that proved that graphic humor can be infused with poetry and wit, while still tackling “serious” subjects; such as the tumults of daily life and their often inevitable existential challenges. Like any other New Yorker, I find myself staring at subway posters while I wait for my commuting train. Without getting preachy and seeming hypocritical, I often get baffled by modern advertising and its vacuous promises of ever-lasting bliss with products that often can barely fulfill their own intended function. Most crucially, there’s the underlying suggestion that the more we acquire or consume, the happier we could (or should) be, which of course rarely is (if ever) true. Most of us are aware of this. And yet these glossy, pitch-perfect ads that seem to be concocted in a parallel but seemingly faultless world keep luring us into dispensing with our hard-earned cash, in exchange for some ever-elusive nugget of happiness that we’re apparently (inexplicably!) deprived of. An early idea that payed homage to Cassandre’s immortal Dubonnet Man (while spoofing you-know-who), which I eventually abandoned after deciding it did not fit the tone and intent of the series. It’s a trap we can’t help but fall into, whether we’re aware of it or not. It poses an interesting conundrum, as well as certain questions of identity and self-contentment. Fitting fodder for the pseudo-ads and aforementioned visual puns that started emerging from my sketchbook—some of them reproduced here in their rawest form. On a more technical note, I wanted to experiment with two-tone graphics—usually letting the second color highlight the emotional or conceptual aspects of each piece, while playing with the visual balance of the colors (and I certainly think of black as a color) on the page. Another interesting but enticing challenge was to find ways to add visual variety and expression with that limited palette, and that’s where mark-making and texturing became essential ingredients in each drawing. As of this writing, I’m not sure whether there will be more pieces added to this series, but—as a whole—I consider them a breakthrough of sorts. They allowed my “funny bone” to resurface, and hinted at other directions to pursue. Making these images also reminded me of an important lesson that’s surely old hat to many seasoned creatives: let your work breathe and grow without trying to control its direction too much. The more you play and listen to your intuition, the more the outcome will surprise you. 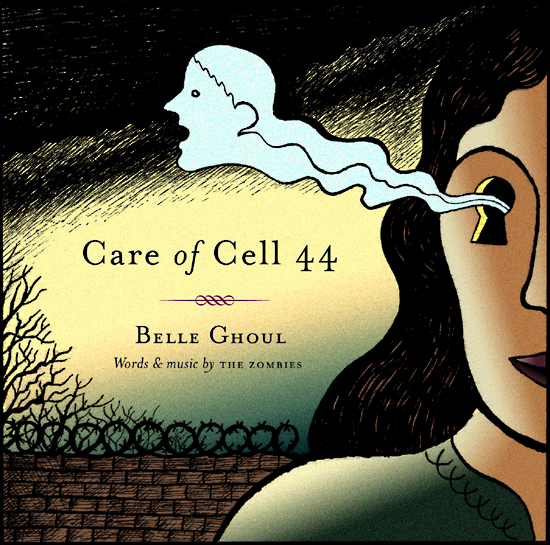 Halloween aftermath/welcome to November: For the past two weeks, I’ve had the pleasure of collaborating with long-time friend Jesse Paris Smith and her fantastic New York-via-Michigan band Belle Ghoul. They specialize in spectral, lush, sugary pop, having recently released an EP of their own compositions through Elefant Records, as well as a smattering of singles, self-released tracks, and covers. Jesse asked me to come up with artwork to accompany and promote their online-only/free-downloadable take on the Zombies classic Care of Cell 44—she said they were looking for a visual that was “sweet but spooky”. In case you’re not familiar with this little gem of 1960s British pop, Care of Cell 44 is written as a tender letter from a narrator who’s anxious to see his lover, after she’s completed an extended jail sentence for an unspecified crime.